The Representative DeMolay Award was created by DeMolay Founder, “Dad” Frank S. Land, to encourage all members of DeMolay to evaluate and develop a well-rounded life that is characterized by the practice of the virtues and values of the Order. 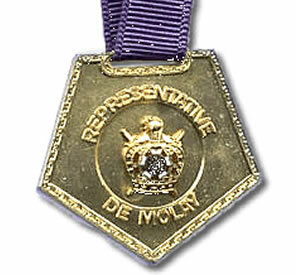 To this day, the Representative is the highest award for self-achievement that can be earned by an Active DeMolay. The Representative DeMolay program is one of self-evaluation. Members seeking to obtain the award must evaluate their development in various areas of life. A detailed and honest evaluation is required.Those who show progress in all-around development and a firm understanding of their own strengths and needs are awarded the high honor of being called a Representative DeMolay. “Dad” Land’s goal was for every DeMolay to be a Representative DeMolay, not merely by holding the award, but by living in such a way as to make the Order proud to call you its own. And, because of your own effort and time, you can be proud to wear the title and insignia of this award. Forms for applying for the Representative DeMolay Award in Pennsylvania are available for you to print here on this site (see below), or can be obtained by request from your Chapter Advisor or the Pennsylvania DeMolay office. For questions about the program, or your application process, you may contact the PA DeMolay office at 717-367-1536.